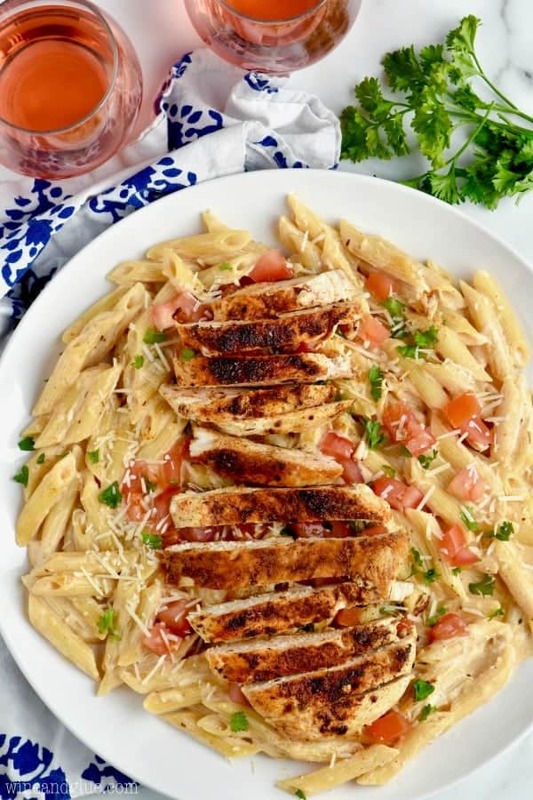 This Creamy Cajun Chicken Pasta comes together so fast! This easy chicken dinner recipe is the perfect combo of spicy and creamy! 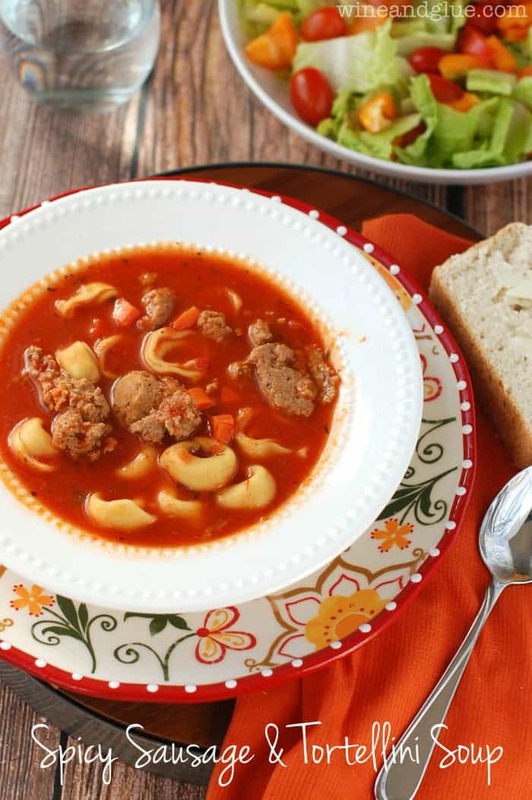 You will love every single thing about this recipe, from how easily it comes together, to how delicious and comforting it is to eat. If this is your first Cajun inspired recipe that you are making at home, don’t stop here, make this Cajun Cobb Salad and this Jambalaya soup. They do not disappoint. And with your own cajun seasoning recipe on hand, they are even better! I am so happy to be partnering with Sutter Home for their #SweetonSpice program to bring you this incredibly easy weeknight dinner with a kick! Pair it with a glass of their delicious White Zinfandel! Can I tell you guys a little secret? It’s seriously not a secret at all. I love cooking with wine. Like in my glass. 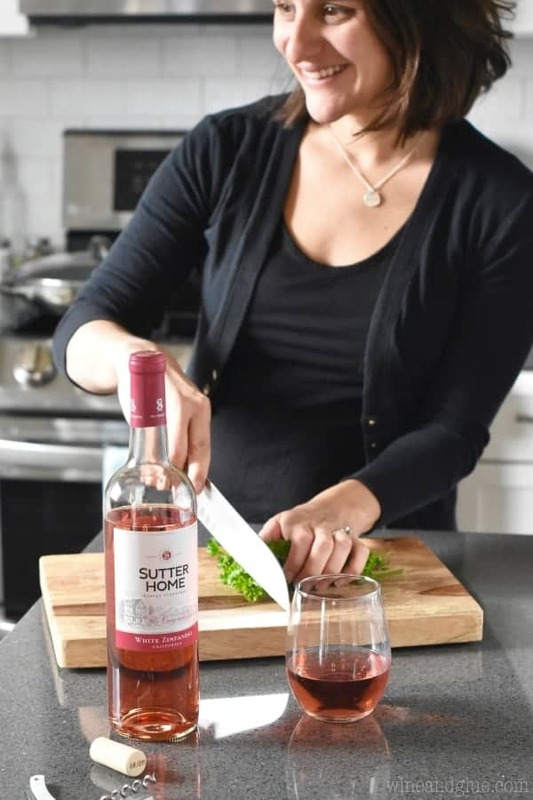 Sutter Home’s White Zinfandel is perfect for date night and perfect for sipping while cooking! It’s delicious, slightly sweet, and has notes of melon and strawberries. In other words, I’m going to be sipping it all summer long! It’s also perfect when paired with slightly spicy food! 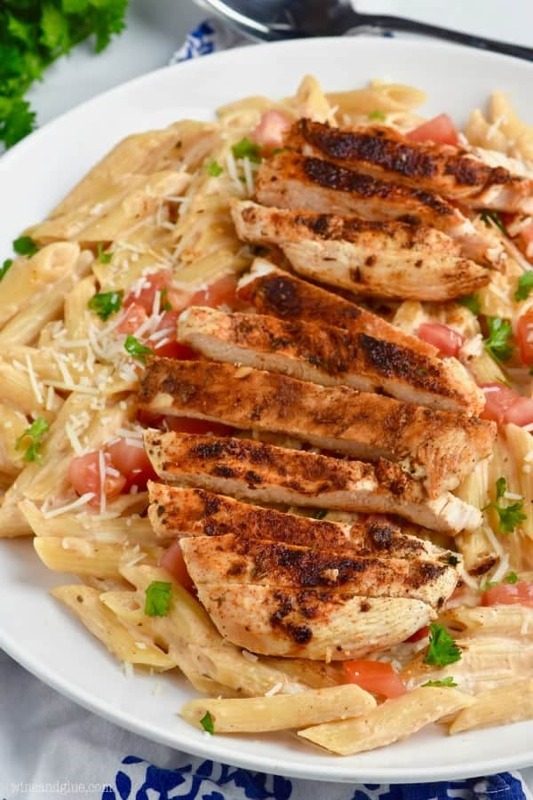 Like this Creamy Cajun Chicken Pasta! It’s a restaurant classic that is super easy to make at home. It’s like a dreamy meal, perfect for date night in, that is done in 30 minutes! You guys. It doesn’t get any better than this. For real. This recipe is easy to make but there are a few things to keep in mind to help it turn out perfectly. It’s a good idea to have all your ingredients out and ready before you begin this recipe. It will make it go more smoothly. Make sure you pound the chicken thin. It is what is necessary to make it cook quickly and make this the fast amazing dinner that it is. If that’s not something you’re interested in, you could slice the chicken breasts in half lengthwise, though you may need more cajun seasoning to cover them. Keep an eye on your garlic in the butter and if you do happen to burn it, start over. Nothing ruins a recipe faster than burnt garlic. After adding the flour, it’s important to slowly whisk in the liquid. It is what leaves you with a nice creamy sauce. 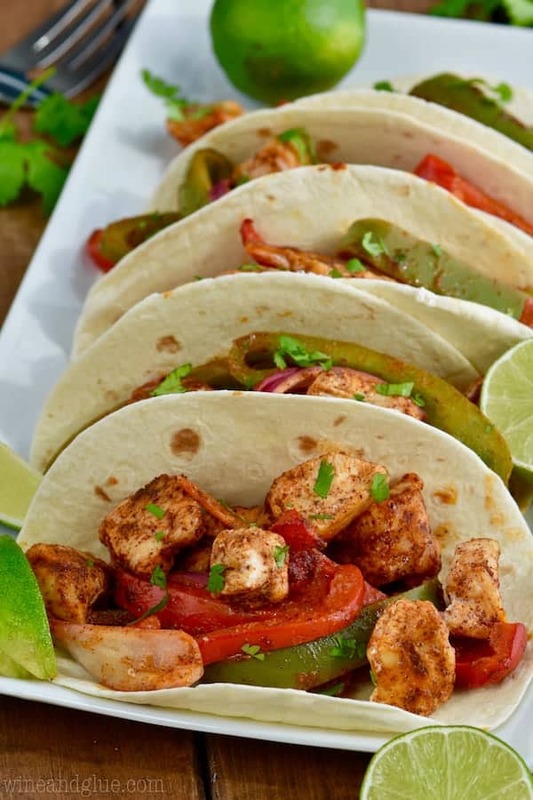 If you are looking for more delicious dinners to pair with Sutter Homes wines, make sure to try these Spicy Sriracha Shrimp Tacos, For more delicious spicy meals perfect to pair with Sutter Homes White Zinfandel, follow them on Pinterest, Facebook, Instagram, and Twitter. 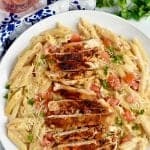 This Creamy Cajun Chicken Pasta comes together so fast! This easy chicken dinner recipe is the perfect combo of spicy and creamy! While the pasta is cooking, heat the extra virgin olive oil in a large skillet over medium heat. Season the chicken on both sides with 1 TBSP Cajun seasoning. Add to the skillet. Cook for about three minutes on each side or until the chicken reaches an internal temperature of 165 degrees. Remove the chicken from the skillet, clean it, and return it to the medium heat. Melt the butter, add the garlic and sautée for about 30 seconds. Whisk in the flour and cook it for another 30 seconds. Very slowly add the half and half, initially about a tablespoon at a time, so the sauce thickens. Add more quickly after you have added about half a cup. Stir in the parmesan cheese and allow it melt completely. Add the remaining 1/2 TBSP Cajun seasoning and season with salt and pepper to taste. Add the penne to the sauce, top with tomatoes, parsley, parmesan cheese, and the sliced cooked chicken. Wine + Pasta = My favorite dinner ever! It just makes me happy! 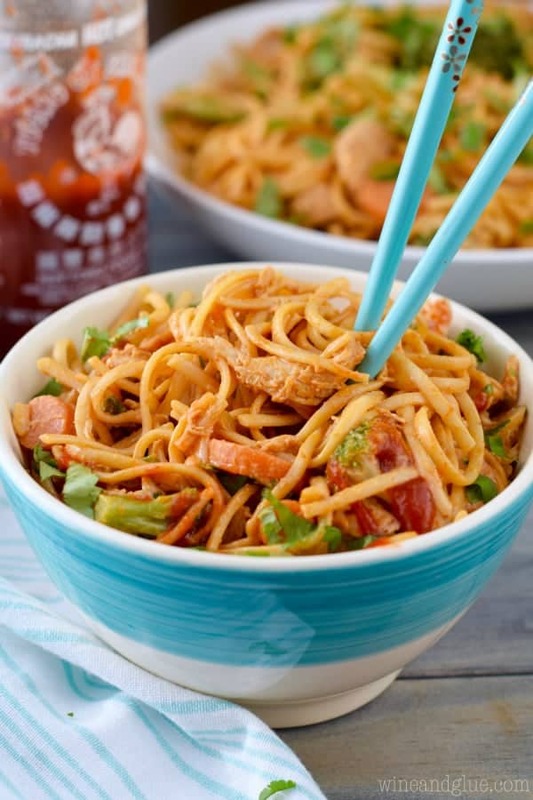 Spicy chicken with classic pasta sounds like a perfect dinner to me. Saving this recipe! You’re so pretty! And so is this dish! I can’t wait to try it! What a great looking pasta! Dinner time!! This was very good and pretty simple. I added a couple other seasoning and I love this I will add shrimp next time. Looks like you burnt the crap out of the chicken, lol. But the pasta looks good, might give this a go. Rod, the spices are blackened, the chicken isn’t burnt. It’s tender and super delicious. You have a GREAT rest of your weekend! His use of the word “burnt” is a dead giveaway that ‘rod’ isn’t American. This is probably why he’s not familiar with the “blackened” Cajun way of cooking, which is just yum! What are you pourin in milk? It’s not on the ingredients or the video….. Wondering what you mean by “clean it” … the chicken. I was referencing the pan, clean it after making the chicken in there. What exactly is Cajun seasoning? Can I buy it in a bottle? It’s a spice mix and sold the same way oregano or cinnamon or other spices are sold. Can I freeze and reheat? What temp & for how long if so? This wouldn’t be my choice of meals to freeze and reheat. If you give it a go, let me know how it goes. Just made this and it was amazing!!! 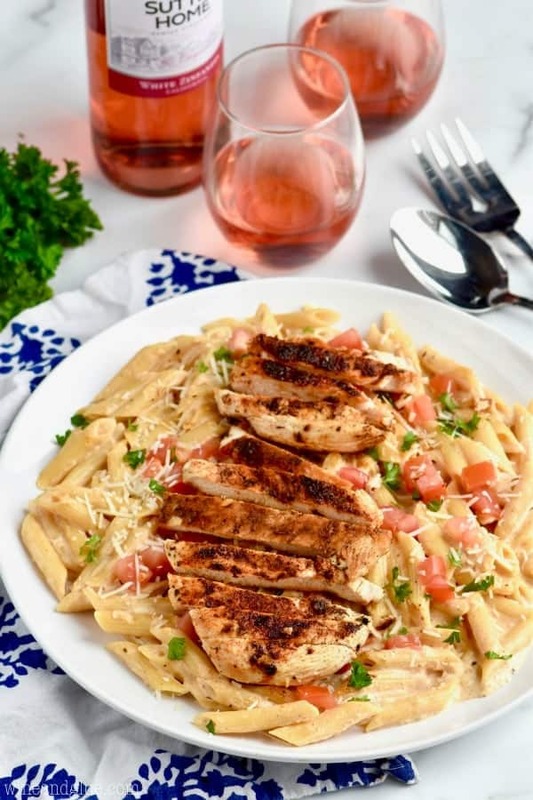 Love that you use half and half in this cajun chicken pasta dish! I need to try this version soon. Where did you get your tongs that you used while cooking you chicken in this recipe? Hi Angie! I actually wouldn’t recommend those. They get stuck sometimes and won’t spring back open when I’m cooking with them. I found these ones on Amazon that are really highly rated and relatively inexpensive. Instructions are not very clear, this recipe as a whole looks delicious but was not. I was super excited to try this, did everything as instructed (which wasn’t very clear) and it’s really not that good. Definitely have made better. I’m so sorry that you didn’t like this dish. We’ve made it multiple times and loved it each and every time. I’d love to know which part of the instructions you didn’t find clear, so I can update it. It reads clear to me, but of course I’m the author of it. In the future, the recipes that contain videos (as this one does), might be worth watching to help clarify steps and give you a visual.